1. Beat the mascarpone with the caster sugar then fold in the whipped cream. Pour the sherry into a separate shallow dish. 2. 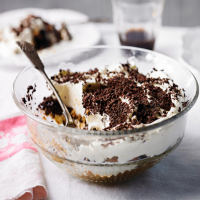 In a shallow glass serving dish, layer up the mascarpone mixture with the gingernuts and grated chocolate, dipping the biscuits quickly in the sherry to soak up a little. Don’t allow them to get totally saturated and soggy. Finish with a layer of mascarpone then chocolate. Cover and chill for at least 2 hours to allow the flavours to develop. This recipe was first published in Tue Aug 28 14:08:51 BST 2012.